Picture - Mi-6 at Riga, Latvia. The Mil Mi-6 (NATO reporting name "Hook") was a Soviet/Russian heavy transport helicopter designed by the Mil design bureau and built in large numbers for both military and civil roles. The Mi-6 was first flown in September 1957. Getting this large vehicle in the air is no easy task; the Mi-6 has an enormous gearbox, heavier than its engines, and often uses short wings to relieve the load on the rotor in cruise. Not only was it for a long time the largest helicopter in the world, it was also the fastest with a speed of 300 km/h. Its maximum load capacity is 12,000 kg. When designed in 1954-56 it was by far the largest in the world, and even today its dynamic components of engines, gearbox, rotors and drive shafts are considered state-of-the-art. In its early days this helicopter set many world records, including one for sheer circuit speed at over 211 mph (340 km/h). In 1959-72 a total production of at least 500 was built for various general transport, utility, firefighting and flying-crane duties, the last two sub-types not being fitted with the large fixed wings which in other versions bear part of the lift in cruising flight and thus enable higher speeds to be attained. The twin nose wheels and large low-pressure main wheels do not retract. Normally flown by a crew of no fewer than five, the Mi-6 seats 65 armed troops and can alternatively carry 41 stretcher (litter) patients and two attendants, or a wide range of bulky loads, including vehicles, loaded through rear clamshell doors. In exercises fleets of these aircraft have airlifted many kinds of weapons, including FROG-7 rockets on their PT-76 tracked chassis, as well as large radars and heavy artillery. All Soviet APCs (Armoured personnel carriers), armoured cars and light MICVs (mechanised infantry combat vehicles) can be carried. V-6 : (Zavod No.329 Moscow) First prototype series. Mi-6 (NATO - Hook-A) : Heavy-lift transport helicopter. Mi-6A : Civil transport helicopter, with accommodation for between 65 and 90 passengers. Mi-6T (NATO - Hook-A) : Military transport helicopter, which can seat up to 70 people on tip-up seats along the cabin sides, with additional seat along the center-line. Mi-6VKP (NATO - Hook-B) : Command post, electronic warfare helicopter. Mi-6BUS (NATO - Hook-C) : (Also Mi-6AYa and Mi-22) airborne command post helicopter of 1975. Mi-6AYaSh (NATO - Hook-D) : (Also Mi-6VUS and Mi-6VzPU) airborne command post with SLAR. Mi-6L : (Also Mi-6LL: Letayushchaya laboratoriya) Flying laboratory variant with D-25VF engines used for flight improvements of the Mi-6 and testbed for the powerplant of the Mi-12. Mi-6M : Anti-submarine variant armed with four aerial torpedoes and ASW rockets, and equipped with various experimental ASW systems. First built in 1963 and modified in 1965 for the "Barge Hauler" program. Mi-6P : Passenger transport helicopter, with accommodation for approximately 80 passengers. Mi-6PP : Electronic reconnaissance and AWAC detection jammer developed in the 1980s. Mi-6PR : (Protivodeystviya Radiorazvedke) Development in 1962 for jammer/electronic warfare variant. Mi-6PRTBV : A few modified as mobile rocket/technical bases and rocket fuel transports. Mi-6PS : Search and rescue helicopter developed in 1966 for pick-up of the landed "Vostok" and "Soyuz" space modules. Mi-6PSA : Little-known modification similar to Mi-6PS. Mi-6PZh and Mi-6PZh2 : . Mi-6R : (Retranslyator) specialised radio communications variant developed in 1974. Mi-6RVK : Tested in 1965 armed with mobile missile launchers. Mi-6S : Medical evacuation helicopter, which can carry up to 41 litters. Mi-6TP : Convertible freight/passenger helicopter. Mi-6TZ : (Also Mi-6ATZ) fuel transport helicopter. Mi-6VR "Vodoley" : Experimental Mi-6 developed in 1976 for testing helicopter de-icing systems and for testing the rotor system of the Mi-26. Mi-6? : Developed in 1962 with collapsable BU-75BRM drilling rig for oil exploration in Siberia. Exact designation unknown. Test pilot N.B. Leshin has set the world record of speed. This event was awarded by the American Helicopter Society. Small numbers are still in service, most in Siberia plus a small number with the People's Republic of China. The Russian Air Force currently operates 5 Mi-6s. 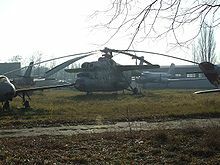 Several contaminated Mi-6s can be found with the thousands of other pieces of equipment in the "vehicle graveyards" in the Chernobyl disaster alienation zone.